It’s funny, ironic, disingenuous, and sad that the clamor of support for the men and women who answered the nation’s call to arms has changed to a clamor for the evisceration of the benefits that were promised to them for risking their lives to protect those unwilling to serve. Even though the bullets are still flying and Soldiers, Sailors, Airmen, and Marines are still fighting and dying in Afghanistan, the elected and appointed leaders of our nation are shamelessly backing away from the commitments they made to those in uniform. It started with “pension reform”, which is a blatant and arrogant rewriting of history in order to shave a few billion dollars off of the promised pension benefit that those who devoted twenty or more years of their lives to the nation earned. When I enlisted I was promised that if I served a career in the military, I would receive a pension that included a Cost of Living Adjustment (COLA) that was based on the Consumer Price Index (CPI), not the CPI minus one percent. I served a total of 27 years under that assumption. Unfortunately, Senators Ryan and Murray (neither of whom has served a single day in uniform or watched their friends go home in a body bag) decided that my assumption was incorrect and that the promise my recruiter made in 1984 was a lie. Then came the retraction in TRICARE Prime service area availability. It turns out that if you retired from the military and took advantage of TRICARE Prime, you were entitled to utilize the program wherever you decided to plant your flag. As of last October, however, 171,000 retirees found that the promise was subject to the expedient whims of the people who promised such coverage. That is in addition to the intractable whining by those who have not earned the benefit of subsidized TRICARE Prime premiums and are eager to make sure that veteran retirees pay “a fair amount” for their health care. Then came the news that the pentagon is working to eviscerate the commissary system. Sure, I am now retired and can shop at the local supermarket, but since I live by a military base I don’t. I shop at the commissary because it is a benefit that I earned through my service in a couple of wars and a few decades of peacetime service. Again, my recruiter is a liar because he promised me something that the DOD has decided I probably don’t need. I say thank you to everyone who wants to cut the benefits that military men and women have earned in the service of the nation. You have confirmed that you lack the moral courage to actually pick up a rifle and use it on the enemies of the United States, but you have the shameful mendacity to plunge a knife in the backs of those who have. I recently had the good fortune to swap emails with a leader in the IAVA: Iraq and Afghanistan Veterans of America. They are holding a membership event this evening (Wednesday, 22 January 2014) aboard the USS Midway, the aircraft carrier museum that is on the San Diego waterfront. Join us for a gathering with IAVA staff and IAVA Leadership Fellows, Veteran Transition Managers and local IAVA members. Learn more about what IAVA has accomplished over the last year, the benefits of membership (it’s free! ), and the exciting programs and events we have coming up in 2014. Member Veterans, supporters and anyone interested in learning more are welcomed! If you are interested in attending, follow this link to register. It seems like a pretty interesting event and an even more interesting organization. I will certainly be engaging to learn more about what they do and how they help veterans. Check out the event if you are in the area! This is a repost of Tony Carr’s exceptional piece on the effects, both intended and unintended, of breaking the nation’s commitment to its military retirees. The implications of changing the COLA for the military retirement plan go infinitely deeper than simply saving the taxpayer six billion dollars. In my humble opinion this article is the best yet written on the COLA debate, and you can go to the original posting at John Q. Public. Since 1973, America has relied on volunteers to fight its wars, and they have relied on America to take care of them when the fighting is over. Led by Paul Ryan and Patty Murray but abetted by Barack Obama, Congress recently gambled with our nation’s future for an extremely modest short-term gain. In doing so, it was given aid and comfort by knowledge-starved pundits, axe-grinding editorial boards, and self-anointed armchair analysts everywhere, as it left the military and veteran community standing with their jaws on the ground in despairing disbelief. Exploiting pressure to strike a budget compromise, Ryan and Murray entered into an unholy alliance to reduce veteran pensions – including those already vested under previous covenants – by an average of $84,000 to $120,000. They obscured this act, as often happens when attempting to mislead, by employing complex-sounding budget doublespeak to minimize the magnitude of the associated moral breach as well as the consequences to veterans and families. In a way, this debacle can be seen as part of our nation’s continual inability to comprehend and bear the costs of being a global superpower with quasi-imperial interests secured by less than one-half of one percent of its population. But the particulars in this case suggest something more disturbing lurking behind the standard wallet-grabbing Congressional milieu: a startling absence of strategic deliberation. When such a deficit impairs elected leaders responsible for national security, potentially grave consequences attend. Good strategists always ask of any potential course of action two key questions. First, what will this do for us? And second, what will this do to us? Given the dearth of statesmanly impulse at the national level in modern America, it is perhaps unsurprising that in crafting the recent budget, Paul Ryan and Patty Murray asked only the former question, leaving the latter for others to worry about. The provision at issue retroactively renegotiated the deferred compensation of more than two million military veterans – including tens of thousands still serving in harm’s way — who did their duty in reliance on promises around which they structured their lives. The vast majority of these veterans endured historically abusive operational tempos. Most will carry with them the invisible scars of war for the rest of their lives, running up against psychological limits that in subtle but consequential ways – ways no one who hasn’t served could possibly understand even if veterans were immodest enough to attempt explanation. 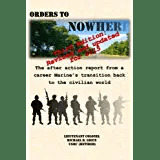 Many transitioned out of military service (or will in the future) to find that their skills and capabilities did not translate well in the private sector. This can slow earnings growth, making an earned military pension critical during the adaptation to civilian life in a down economy. Those retirees fortunate enough to preserve their marriages have typically dragged spouses through a dozen or so relocations, never giving them a chance to establish professional footing. This is key, not just in terms of the sacrifices rendered by military families, but in economic terms; in modern America, two incomes are now required to generate the same standard of living one income provided thirty years ago, and this is often beyond the reach of retired military families who have led very abnormal lives prior to retirement. The All-Volunteer Force relies heavily on the 17% of its members who choose to serve for a career, most of whom are NCOs. The shorthand employed by Ryan to sell his beloved pension cut envisions healthy, well-adjusted, fattened mercenaries stepping into corporate America to collect millions during the balance of their working years. How he arrived at this vision boggles the imagination; most retirees struggle to integrate into a new workplace with skills that don’t directly translate while trying to keep pace with competitors roughly half their age. 73% of retirees are noncommissioned officers whose pensions are barely sufficient to keep them above the poverty line. As a rule of thumb, these people are figures of sympathy rather than valid targets of the socialistic “they don’t need it anyway” notion behind Ryan’s sales pitch. Ryan and Murray obviously weren’t thinking about these issues. They also weren’t thinking about the fact that every veteran who has retired since the year 2000 made a decision upon reaching 15 years of service: either turn down a $30,000 career status bonus and retain an inflation-protected pension upon reaching retirement, or accept the bonus and also accept a 1% annual reduction in cost-of-living adjustment with a one-time “catch-up” at age 62. Most veterans chose inflation protection, which ends up being worth far more in most calculations than the bonus. In summarily removing inflation protection from all military pensions, Congress breached the contract formed with those who turned down the 15-year bonus. It did this without holding a single committee meeting or public hearing. In a clear signal it wasn’t thinking strategically, Congress did this in a back room not populated by the joint chiefs, who claim to have been surprised by the provision altogether. But this all makes sense if Ryan and Murray were only asking “what will this do for us?” And it did a couple of things. First, it bought them the public acquiescence of the service chiefs, who are desperate for funds given the limits of sequestration imposed without mission relief. Their only option to preclude mission failure is to hold open the gate while others raid the pensions of the very people whose interests they’re charged to safeguard. This perversely explains why they said nothing as a provision impacting the career decisions of every active duty and retired member of the military sailed through uncontested. But what the provision really did for those who championed it was to lay the groundwork for a new funding stream to perpetuate pork barrel spending. If this provision sticks, Congress will have retroactively renegotiated the compensation contracts of more than two million war veterans during a time of war. If a promise of this magnitude can be rendered so cheap with so little effort, nothing is sacred. This will create broad legitimacy for further pension and benefit raiding, making this just the first of many breached promises and a lucrative source of cash by which Congress can purchase electoral advantage. It does this by funding needless bases and infrastructure (to supply jobs in their districts), by acquiring and continuing to operate needless weapons (again, jobs), and by continuing to support the nation’s promiscuous involvement in wars of choice that are a boon for defense contractors and war profiteers . . . and therefore, a steady source of votes and contributions. Footnote: this is an election year. The Ryan-Murray pension-raid was not a “mistake” as some have claimed and as I’ve suggested elsewhere is a fallacious notion. It was a calculated breach of the faith for short-term political advantage. Ryan, Murray, Obama, Hagel, and the rest of those who pushed and supported this knew they were acting immorally, but were willing to accept doing so out of a rational calculation of what it would do for them. What they didn’t ask is what it might do to them . . . or more importantly, what it might do to us, the nation they claim to lead. In the modern age, politicians tend to be tacticians rather than strategists. They’re interested in winning a series of short-term battles that supply them with talking points for use in the next election. This is so because getting elected has replaced principled leadership as the contemporary political raison d’etre. By extension, raising campaign funds has come to dominate the activity of elected representatives, displacing time and focus essential to strategic reflection. But in failing to take a sober, adult look at the future when making decisions, politicians assume huge risks on the behalf of the nation as they collect rewards that fall narrowly to them. When it comes to the legal heist recently carried out against veteran pensions, the risks are enormous. Alienating today’s warriors risks destroying the willingness of others to step forward in the future. Military service is very much a family business; it’s difficult to find an active member who isn’t acting on the example of a relative or ancestor. Military service immerses individual warriors in a system of values rooted in honor, trust, and commitment. This makes them particularly sensitive to moral compromises. Ordinarily content to serve with quiet obedience, military members will not hesitate to sound off when they see an obvious moral wrong perpetrated (and woe betide us as a country if ever they became blithely accepting of such wrongs). They’ve shown in the past few weeks that attempts to breach trust with them will not go unnoticed or unmarked. The implication for politicians is clear: when you break a promise, you’re tampering with the delicate formula upon which the strength and vitality of the all-volunteer force is based. The consequences to future American security could be severe, and should be studied carefully before risking even the perception of a moral breach. Pension formulas were last disturbed in the mid-1990s, creating a retention crisis that sent the joint chiefs panicking to the Hill, where they persuaded Congress to restore a 50 percent, inflation-adjusted retirement package. All we’ve done since then is ask even more of our volunteers, and nothing suggests they are today any less sensitive to these kinds of budgetary shenanigans. Politicians claim a choice between readiness and personnel funding, but this is a false choice. Tampering with promised pensions could fundamentally injure readiness by hurting morale and chilling volunteerism. But there’s a deeper and more insidious risk already touched upon, and that’s the risk attendant to avoiding genuine reform of our defense institutions. It’s true that current defense spending is unsustainable. It’s not true that this is a result of personnel costs. They’ve remained constant at about 25% of defense spending since 2001 (despite two manpower-intensive wars) and are down from 30% of spending since 1991. Other elements of defense spending have grown explosively over the same period of time. The nation has expensively fast-tracked new capabilities from scratch as a result of being caught strategically off-guard by 9/11 (this, in turn, is attributable in part to the recklessly rapid pace of intelligence downsizing in the prior decade, which afforded America reduced global awareness as the calculus of national security shifted wholesale). It has also fielded costly new weapons systems in an attempt to contend with an uncertain future, virtually all of them coming up short of expectations and over budget as a result of a dated acquisition process riddled with misplaced influence and needless red tape. Meanwhile, unneeded bases remain open and their facilities remain operating due to Congressional obstruction, and no serious discussion concerning service roles and missions has been undertaken in nearly three decades. As a result, the services are tripping over one another with duplicate weapons and capabilities, a bonus for defense contractors but an injury to taxpayers. If Congress is once again permitted to step over dollars to save dimes and mask the waste lurking in defense spending, we’ll continue tracing along the path of unsustainability without addressing it. Eventually, those masked costs will come due, and it won’t be Ryan or Murray who pay for it, but every citizen who loses security. To be fair to some counterarguments, there is a real need to study military compensation and benefit structures and ensure they fit within our means. But this should be forward-looking in order to keep the faith with those who already kept their end of the compensation bargain, and it should be preceded by a genuine attempt to address the structural reforms Congress is avoiding. If Americans really want to see a drastic reduction in defense spending, they must encourage their representatives to stop obstructing a Base Realignment and Closure Commission and to charter a Roles and Missions Commission. Moreover, Congress should bind itself to the recommendations of both in order to avoid the political mischief that has characterized previous reform efforts and led to the current morass. But even more than that, if Americans want to see drastically reduced defense spending, they should stop electing and emboldening politicians who send American troops into wars without fully advertising the costs of doing so. This is the greatest risk of all — a risk potentially fatal to our national life. We’ve developed a nasty habit in the modern age of waging war without paying for it, and that has set us on a long road to ruin. We’ve yet to pay for the wars fought in the last 12 years, having pushed the costs off on future generations by borrowing against the national debt (save for the $6B pick-pocketed from those who did the fighting). No raised taxes (in fact, tax rates are at a record low as Congressional conservatives who voted overwhelmingly to authorize wars and troop surges complain about the national debt). No war bonds. No draft. No appeal to our richest citizens to finance an expedition. We’ve been at war for a dozen solid years without asking Americans at-large to make a single material sacrifice. Now we turn to veterans and expect them to foot the bill. Veterans understandably refuse to willingly do so, not only because it is unspeakably wrong for them to have been asked in the first place, but because they understand covering up the cost of war is dangerous to our way of life. When war no longer carries even the faintest whiff of sacrifice for the vast majority of citizens, they will readily support it without rigorously considering its necessity or the manner of its execution. This is a path to endless war, and when we have warred enough that our interests have become overextended and we’re bogged down with inescapable obligations we can no longer sustain (hints of which are noticeable already), national collapse becomes inevitable. It’s not a new story historically, and we’re not so exceptional that we can avoid it. Paying our veterans what we owe them is one of the ways we feel the pain of having supported going to war (and by extension, failing to prevent it), and for that reason more than any other, we must pay what we owe . . . even (and perhaps especially) if doing so feels inconvenient. So as Congress returns to session, it seems like a good moment for some unsolicited strategic advice, even if it disturbs the self-congratulatory saccharine party Washington has undertaken in the wake of a signed budget. Congress, you can either have an honorable military, or one that accepts broken promises. You can either have a cheap military, or the world’s best. And you can either have an expensive but secure way of life, or something less. Oddly, doing the morally right thing leads to the best outcome in each of these choices, proving that strategy and morality need not be misaligned. Reconciling the two is matter of considering not only what a course of action does for you, but what it does to your country. Thinking about it this way should compel a swift amendment to restore the promises made to our veterans and their families. Posted by Tony Carr on January 2nd, 2014. You can view the original here. So the government “partially” shuts down. What does that mean to veterans and those still in uniform? Well, it is October 1st and as Halloween decorations are going up the government is shutting down. Partially, anyhow. But what does a “partial” government shutdown mean to those steely eyed killers walking on patrol in Afghanistan and the not-so-steely eyed veterans who are now reliant on the VA for healthcare, disability payments, and/or pensions? 1. If you are serving in the military, then you have little to fear. The congress passed a bill, which the president signed, that guaranteed paychecks for active duty and reserve status military personnel (along with some government employees and contractors). For more information go here. 2. If you are retired and receiving a military pension, then you can rest easy. Since pensions are considered an entitlement and are not funded by annual appropriations they are safe from the shutdown. If, however, the government hits the debt ceiling then they may be affected. For more information go here. 3. VA health care, pension, and disability payments. There is good news and bad news regarding the VA. The good news is that they are lightly impacted by furloughs and medical services will be unaffected, but the bad news is that they will likely run out of funds to pay all of their pension and disability payments if the shutdown lasts more than a few weeks. Other programs, such as the GI Bill and others, will also be hit if the shutdown is prolonged. For information on what is and is not impacted at the VA go here. For information on the testimony that the VA provided congress about the impact of the shutdown (and how it will affect future payments) go here. I hope this helps you get the information you need to understand the effect of the shutdown on you and your family. Let’s just hope that the government of the nation that we swore to support and defend can get its act together and start moving forward again. Yesterday, in Rome, a great friend and supporter of the military and of veterans passed away. James Gandolfini, the iconic actor who redefined the mafioso in cinema and popular culture, died of an apparent heart attack while visiting Italy. Gandolfini, whose acting performances brought him into the top tier of the industry, was so much more than “just” a brilliantly talented actor. He was also a compassionate and driven man who cared deeply for the members of the armed services who were fighting in Iraq and Afghanistan as well as the veterans who rejoined society after hanging up their body armor and combat boots. His contributions to the military are too numerous to recount here, but there are two of his passionate endeavors that have resonated with me personally. As an actor, he has been at the top of his game for over a decade. The roles that he has played and the movies that he has made took a level of dedication and passion and professionalism that would have left a lesser man unable to look past his own career. Fortunately for me and for all who have served, however, he leveraged the professional capital that he had earned and selflessly gave back to those who were wearing the cloth of the nation. He used his talents to produce two incredibly powerful documentaries, both of which I found to be moving and staggeringly relevant in a time of seemingly ceaseless war. In 2007 he produced the documentary “Alive Day Memories: Home from Iraq” in which he told the story of soldiers and Marines who were severely wounded and disabled during their tours in support of Operation Iraqi Freedom. It was not a feel good driveby piece of pseudo-journalism, but instead a heartfelt and heartwrending journey with veterans who had come within an Angel’s breath of dying, yet survived the traumatic violence that robbed them of limbs and, for many of them, hope. Gandolfini took everyone brave enough to watch inside the lives of those who paid the price of freedom with their arms and legs, and will continue to pay it for the rest of their days. He pulled back the curtain and showed the tragic realities of war in such impactfully human terms that it brought the cost of war home in an undeniably compelling and emotional way. Later, in 2010, he produced another powerful documentary about the unseen wounds that affect those who fight in war. “Wartorn: 1861-2010” drew back the curtain on a different and equally debilitating price that veterans face: Post Traumatic Stress Disorder. Gandolfini provided a glimpse into the psychological damage that is wrought by war on those who fight it from the Civil War to the wars in Iraq and Afghanistan. As with “Alive Day”, the documentary makes the audience not just view the subject, but to feel it in a way that is unforgettable. Yesterday, June 19th, 2013 was a day like any other except that on that day a great friend to anyone who has ever sworn an oath to support and defend the Constitution of the United States was taken from the surly bonds of earth. Although he is no longer with us in body, his spirit joins the likes of Bob Hope and Bing Crosby and other giants of entertainment who embraced the military even though they didn’t have to. He will certainly join the likes of Hope and Crosby on the other side of the Pearly Gates, for as anyone who has ever heard the words to The Marines Hymn knows the gates of heaven are guarded by the United States Marines. And they always open the way for one of their own. Semper Fidelis James Gandolfini. You will be missed. It is very challenging to make a quick and successful transition from military to civilian life. There are many obstacles that you encounter along the way, many new things to learn, and a unique set of experiences that you never want to forget. It can really be daunting and confusing at times for any veteran to make the change back to civvie street. Being a transitioning Marine intimately familiar with the realities of PTSD myself I can fully relate. It is tough to make the change from one way of life to another, and it is much more difficult for those with stress injuries as they wrestle the demons within while trying to adapt to a new life without. There is an organization that I am affiliated with that aims to help combat veterans successfully navigate the challenges transition. Veterans 360, a nonprofit organization headquartered in San Diego, is kicking off what I believe is a great program to help combat vets make a successful transition. Veterans 360 has a clearly defined mission: to provide recently separated combat veterans with a carefully developed and managed program of support that will help them develop the professional and interpersonal skills needed to succeed in civilian life. Our goal is that through engagement, education, employment and healing, our student-veterans will utilize what they have learned, manage the resources that are available to them and become equipped for an exceedingly successful transition into civilian life. They help vets by bringing them into an cohesive and immersive environment for the crucial first two months after leaving the service. 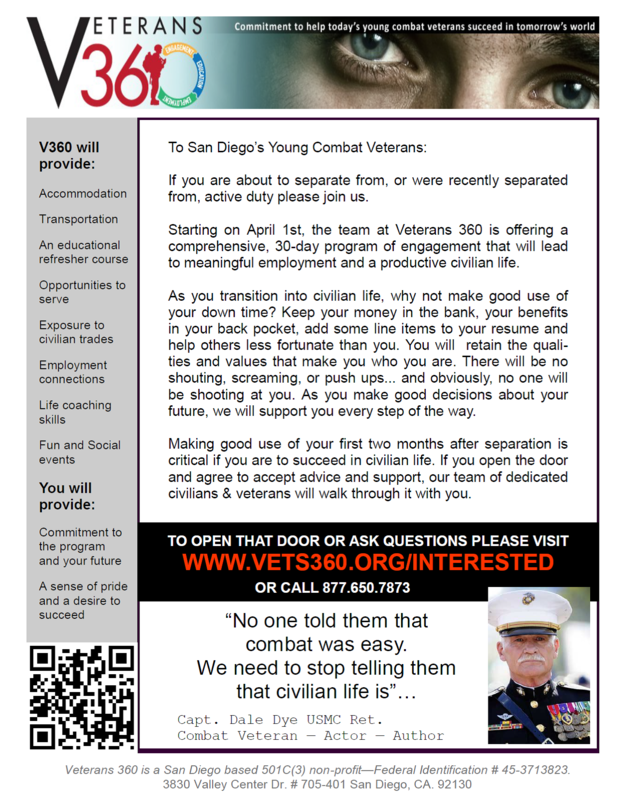 Veterans 360 brings a dozen or so combat vets together, forming a “squad” that will go through an integrated and comprehensive transition program together. They will work live together, work together, and heal together in an environment that centers around engagement with the local community, education focused on basic skills and vocational training, employment facilitation that will help them find meaningful work, and healing to help deal with PTS. All of this is accomplished through individual and corporate donations, and not one thin dime of the veteran’s post-service VA or other benefits will be touched. This is a critical point, as many unseemly organizations and “educational” facilities have sprung up with the cloaked goal to separate the veterans from their money. Veterans 360 is proudly not one of them. If you are a combat veteran in the San Diego area who is looking for something innovative to help with your transition, check it out! In my last blog entry I promised that I would update you on how my first official appointment with the VA went, and, well, that appointment has come and gone. It was interesting, but not really what I had expected. Or what I was hoping for. It was, however, insightful because it provided a glimpse into the road that lay before me as a “customer” of the VA healthcare system as well as introducing me to many of my fellow veterans who frequent the local clinic. The appointment was with the VA Clinic’s PTSD Services unit. As I wrote in my last post, I spent an hour or so with my designated social worker whose job it is (among other things) to assess whether or not I needed to be evaluated for the effects of combat stress. Her assessment was based on our meeting as well as the sixteen page questionnaire that I completed beforehand. Since the questions were all about combat, and having spent a whole lot of time in and around a significant amount of combat in two different war zones, she determined that it was certainly appropriate for me to go for an evaluation. A week later, I returned to the clinic for my first appointment: the Post-Traumatic Stress Disorder Services Orientation. I wandered into the clinic’s Mental Health Services waiting room and, after checking in, was handed yet another set of forms to fill out. After ten minutes of answering questions about my propensity for self-harm, manic episodes, and depression, I was finished. Just in time, too, because as my government issued pen scratched out the last checkmark a young woman opened the waiting room door and asked those of us waiting for the PTSD orientation to follow her. I joined a rather eclectic group as we accompanied her to a smallish room ringed with chairs padded with leather seats and backrests colored in the oddly disturbing green that is prevalent in hospitals and movies about psychiatric institutions. They must have got them on sale somewhere, because I don’t think they would match anyone’s home decor. To their credit, though, they were actually pretty comfortable. Out of the twenty odd-colored seats ten or so were filled by my fellow attendees and me. There was an elderly veteran of the Second World War, Korea, and Vietnam (as his hat proudly proclaimed), a man in his sixties, a few gentlemen in their 50’s, a young woman who never took off her sunglasses, a tattooed young man barely out of his teens, and me. Not at all what I was expecting, to be honest. I had figured that my meeting would be with young veterans from the recent decade of war, but to my surprise we veterans of Iraq and Afghanistan were in the minority. There were three of us, one veteran of Desert Storm, the aforementioned WWII vet, and the rest were from the Vietnam War. I know this because the young woman who led the session (another clinical social worker) had us introduce ourselves before we began the session. In addition to asking where we served, she asked us to share why we were here. The recently discharged veterans were pretty obvious, but the others were a surprise. Each of them had been referred to the session by their primary care provider, which I found to be fascinating. After hearing their introductions and listening to their conversations it became evident to me that many of these veterans were just now entering the VA medical system. To me, that was a surprise because I had never really considered not entering the system. That reveals a tremendous difference between the experiences that “new” veterans have in juxtaposition to the “old” ones. Our transition process from active duty included a mandatory introduction to the VA, along with an education in the basics that the VA provides. Many veterans of WWII, Korea, Vietnam, Desert Storm, and the Cold War received no such exposure to the Veterans Administration. As a result, thousands and thousands of veterans who are eligible for help and care never bothered to pursue it until they really need the services that the VA provides. Unfortunately, for many of them, the help that the VA provides ends up trying to make up for years or decades of neglected conditions. That was the explanation for why so many of the people in the room with me were there for the first time despite having removed their uniforms back when Disco Fever ruled the dance floor. Anyhow, back to the session. After introductions, the social worker ran through a dozen or so power point slides that described the multitude of programs that the VA offered in the clinic. This particular clinic was focused on combat veterans who were at risk for PTSD, and the services that they provide were all focused on countering and healing the effects of combat stress. She started with textbook (according to the American Psychiatric Association, who writes such things) definition of PTSD, which included things like experiencing traumatic events, re-experiencing previous trauma, hyper-vigilance and hyper-arousal, and avoidance of things that remind you of traumatic events. Considering that everyone in the room has served in combat, the probability that at least some of these symptoms would apply to us rocketed up to about 100%. After the explanation of what PTSD was completed she assured that recovery from PTSD was possible. They offered over a dozen different methods to assist with recovery; including individual and group sessions on topics like anger management, coping, spiritually based recovery, couples and family therapy, anxiety disorders, and women’s groups. The goal of each program is to help the veteran reach a positive outcome within three months, with a positive outcome being that the veteran being better able to cope with his or her condition. Not surprisingly the clinic was overwhelmed with veterans who needed help. The wait time to join in the programs was eight weeks or more. The social worker explained the process for getting into one of the groups, and that is where I realized that this was actually not the appointment I was looking for. Actually it was not even really an appointment, but instead just an introduction and orientation to the clinic. Towards the end of the session she explained that for us to participate in any of the offerings we would have to set up another appointment in which we would actually meet with a healthcare provider who would then assign us to a group. An intake appointment, she called it. That was the first indicator that this was not the appointment I was looking for. The second indicator was her announcement that the clinic did not have anything to do with disability claims. As you know from my previous posts, I was actually hoping to get my disability claim back on track. It had been five months since I had been notified that the claim had been partially settled and that I should wait to be contacted by the VA for further evaluation. After spending almost half a year listening to the sound of no telephones ringing I called the VA to get the ball rolling. I had wrongly assumed that once I was in the system that the claims process would proceed as a matter of course. I would need to call another number for that, or I could stop by the Veterans Service Office that happened to be just across the hall. They would be able to help those of us working on our claims, she said, but unfortunately not today because their office was closed. She then reviewed all of the forms that we completed prior to the session, and then she called each of us out individually to set up appointments for the intake interview. I was a bit disgruntled, but resigned myself to just go with the flow and left the session with an appointment for an intake appointment some six weeks in the future and the phone number to the clinic’s VSO office which would help me with my claim. I also left reminding myself that the VA was a bureaucracy and that patience was a virtue. I was still disgruntled, though, and not feeling particularly virtuous. So it goes. 1. The medical side of the VA is different from the disability claims side of the VA. Make sure to stay engaged with your VSO to ensure that your claim is moving forward, and also be specific with the VA representatives when you are making your appointments. I was not specific enough because I made some errant assumptions, and as a result I have lost another month or two of forward progress on my claim. 2. Be ready to devote a lot of time to the VA. There are great programs available, but it will take a long time and plenty of seemingly repetitive red tape, paperwork, and meetings to actually see a provider. Breathe deep, think happy thoughts, and go to your happy place. Time will pass and you will get the help you need. It will just take a lot more time than you would like. 3. Ask questions up front. Had I asked whether or not this appointment would help with my disability claim I would have saved some valuable time. Assume nothing!